Pleasanton City Manager Johnny Huizar, left, and Mayor Travis Hall at site on Goodwin Street near Winship Road during initial phases of AT&T transmission tower erection. 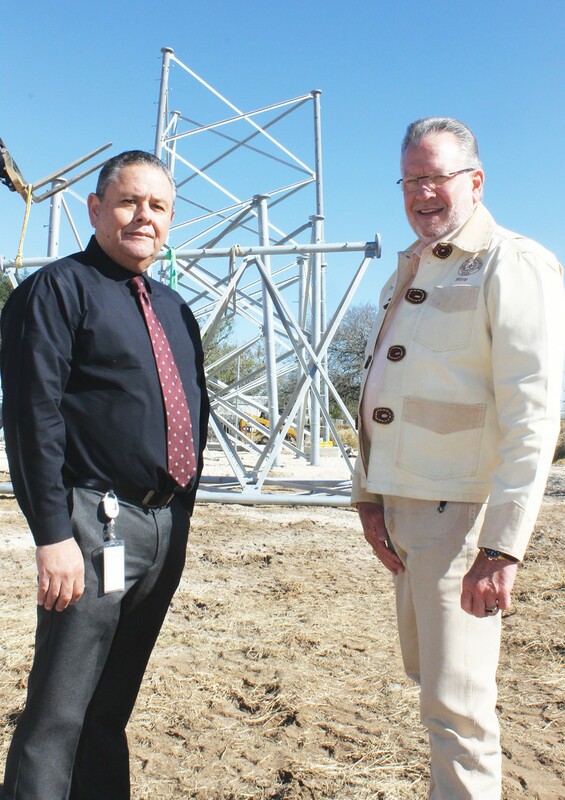 “Once the tower is up, then the guys come in and do the wiring,” said Huizar, “and they said that everything would be ‘turn key’ by the end of the year.” Mayor Hall said, “This will be a nice Christmas present for people in the city.” The Pleasanton Express has also been in communication with county commissioners who have received calls from AT&T on reception issues outside of the city limits. We will keep you updated on progress there.